We are a modern floristry inspired by class and simplicity. We specialize in creating custom rose and floral arrangements, beautifully handcrafted in Parisian inspired keepsake hat boxes. We are artisans when it comes to flowers. We specialize in flowers and we do it better than anyone else. 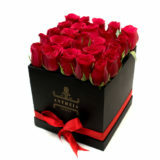 All our flowers are handpicked the same day the boxes are made using the freshest and highest quality flowers available. Our hope is to create an inspired translation of your event: one that will encompass everything from linens to table top styling. We will craft flowers that you will love and remember for years to come with details that espouse your aesthetics. Place your orders one day before your intended date of delivery. All our boxes are hand delivered by a team of dedicated delivery professionals. Our signature packaging is an amalgamation of all our favorite things: elegant packaging, craft wrapping paper, and designer ribbons. Every last detail is thoroughly executed and carefully curated. aRE YOU READY TO GET swayed?